I have an american version of this recipe I had to modify when I realized our measuring cups were all in ml which I think is the same as grams? So change as needed to correct for my mistakes. 300 grams chocolate chips. More or less, I won’t judge. 😉 If you cannot find chocolate chips (we got them at Costco) then get a couple 100 gram bars of chocolate and chop those up instead. 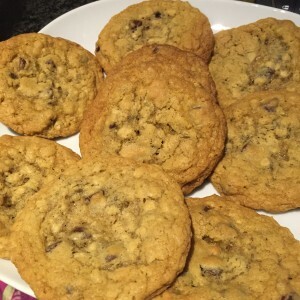 Scoop onto a silicone baking mat/sprayed cookie sheet and bake at I think mark 4 on a gas oven… we can fit nine cookies per square baking pan, though we are use to doing a dozen on our rectangle pan in our previously big american oven but that’s okay! We’re adapting. Kit says it took 11 minutes at mark 4. Verdict is – they are DELICIOUS! Warm and gooey and the measurements worked out beautifully. Hooray!